Looking for a pair of truly wireless earphones without burning a hole in your pocket? How about something that costs just $20.99? Yup, that’s the deal we have today. Truly wireless earphones are great. They allow you to break free from your smartphone or tablet and experience music or podcasts without the interference of cables running all over you. But truly wireless earphones can be expensive at times. Take a look at the AirPods, for example. Thankfully, with companies like Dudios around, you can get the same experience for just $20.99. The earphones on offer feature a truly experience and happen to be Bluetooth 5.0 too. This means that connectivity with your phone or tablet is going to be rock solid at all times and you won’t experience cut-offs while walking through a crowded space. 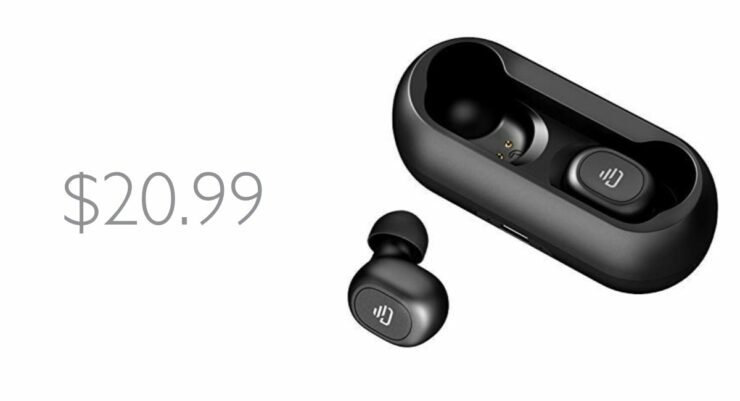 What’s really interesting about these earphones is that they feature 4 hours of playback time and extra 15 hours if you make use of the charging case. In short: you can easily get a week’s use out of these if you are an average user. There’s also auto-pairing baked right in. If you pair these once with your phone or tablet, you can start listening to your music as soon as you remove the earbuds out of their charging case. Last but not the least, there are onboard controls for summoning a voice assistant too. Whether it’s Siri or Google Assistant, you can speak to it right away. Lastly, these earphones sound great and you can expect a decent amount of bass and clarity from them. If you’re up for the deal, then head over to the link below.